It’s been a week since I’ve blogged, but it’s been a SUPER hectic week. More birthday stuff for Stacey, race, Girl Scouts, run, Dan came home from Germany, huge changes at work, etc. Heck of a week. I ran Austin Marathon Relay for the 4th time on Sunday. For the first time ever, I ran a 10 K leg. 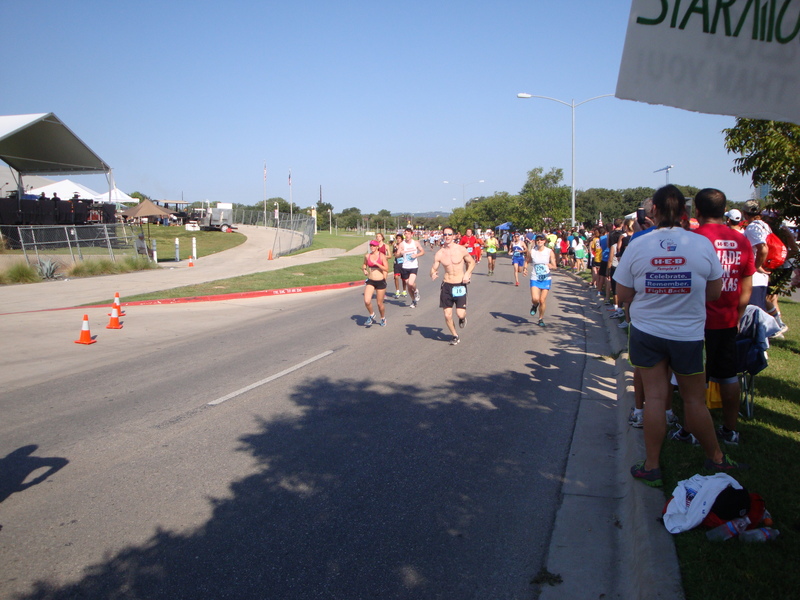 I’ve always run a 5K because I am usually deep into San Antonio marathon training around this time of year. Since I’m not training for anything and we had a few minor injuries, I took a 10K leg. (the legs are 12K, two 10K, two 5K). One of our teams had a no-show. So we shuffled running order, so I would run one of the 10K legs for TWO teams. I was nervous about this. I don’t run 10Ks. I don’t like the distance and can’t get the pace down. Before Sunday, i’d only run two in my life and they were part of a race series in 2008. I knew our other team was just happy to have a complete team, but I knew my regular team is competitive. A major accident had happened on the course overnight, so the race started about an hour late. The race had already pushed the start time back to 8 instead of the usual 7:30. So by time we started, it was getting warm. The later legs you ran, the hotter it got. Granted, it wasn’t in the 100s like it was last year, but it was pretty warm. Not my smartest run race, no strategy at all. I ran a little faster than i’d planned, especially for the heat. I ran a huge PR, but then again, that probably wasn’t hard, since it was only my 3rd 10K ever. (my mom is so fired from taking race photos!) 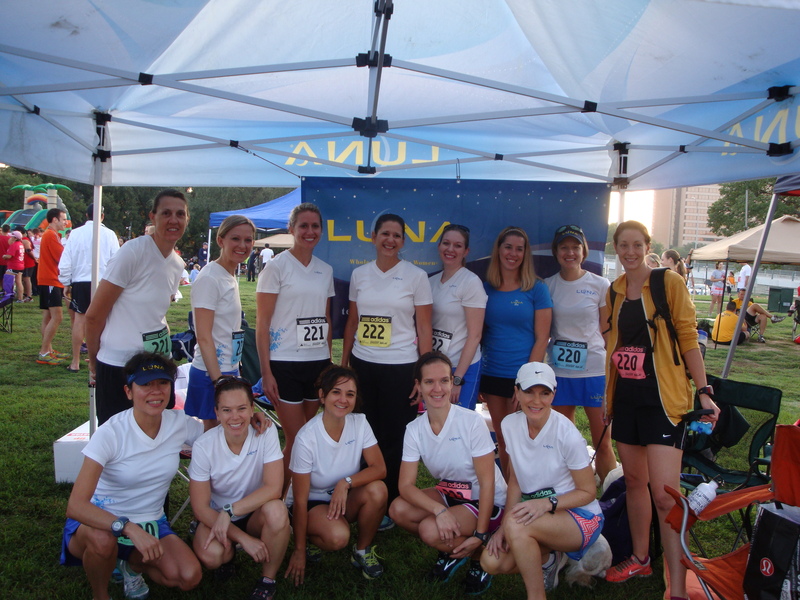 Our teams took 4th, 6th, and 12th in open women out of over 60 teams in the division. I was on the 4th and 6th place teams. 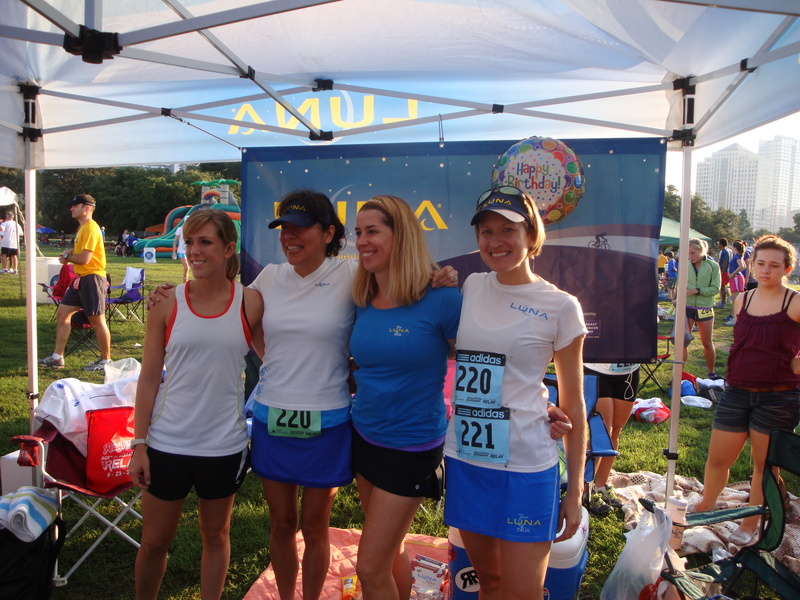 We had a lot of relay first timers, including my sister, who was on the 12th place team and ran her first 10k ever. Most everyone from our 3 teams. So proud of everyone! Cut cabbage into 6 wedges; spread oil on cut sides. 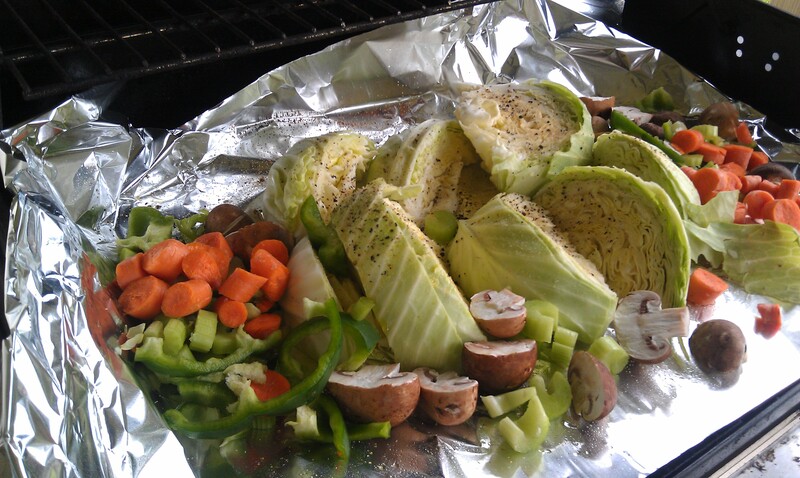 Place cabbage on a piece of heavy-duty foil, about 24 inches by 18 inches. Sprinkle with onion powder, if desired and pepper. Arrange remaining vegetables around cabbage. Seal the foil tightly. Grill, covered, over medium-hot heat for 30 minutes or until vegetables are tender, turning occasionally. This turned out GREAT! I loved it, not sure Dan would eat it, but he’s still in Germany, so more for me. I actually forgot the onion, which I am kicking myself for, but it was still so tasty. I paired it with venison steaks, but I am sure it would be good with anything! 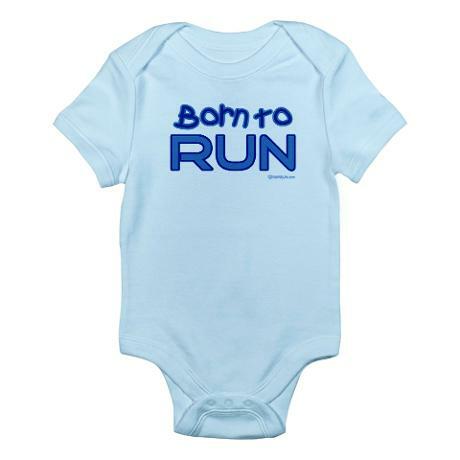 I am so buying this for baby Evan! I can’t wait to meet my nephew in Feb! I used to start every blog post out as a song title. Not sure when I stopped doing that, but I’d likely run out of song ideas by now, although I still do it occasionally. (if you didn’t know, that’s a Robert Earl Keen song). It’s been a week on the new dosage of meds and so far I feel great! I am a little cautious/worried about heart rate but so far it’s been ok (they told me if they jumped me too much too fast on thyroid, I could have issues with that). So far parts of me are working better. Some of the parts still aren’t working at all. It’s still early on this dose and combo of medications. More bloodwork in 10 weeks. Just hoping this progress isn’t covering up other issues. Finally starting to feel more like my old self, 3 years later. My balance at the gym is improving, as is my strength. My speed running is getting back to what it used to be (at least on short distances). My biggest issues are recovering from workouts, sleep, and the moodiness. That and the fact that insurance isn’t covering any of my medications. I haven’t been this happy or optimistic in a long time. I can finally see progress and it’s made a world of difference! I’ve made this recipe several times before, but after tasting my dad’s red beans and rice with Conecuh sausage (it’s an Alabama thing) on vacation, I wanted more. The Hungry Owl in Mobile was awesome, I want to go back. Plus Dan would have loved it, they had at least 15 items on the menu that had Conecuh bacon or sausage in them! I wanted to make this for Dan. 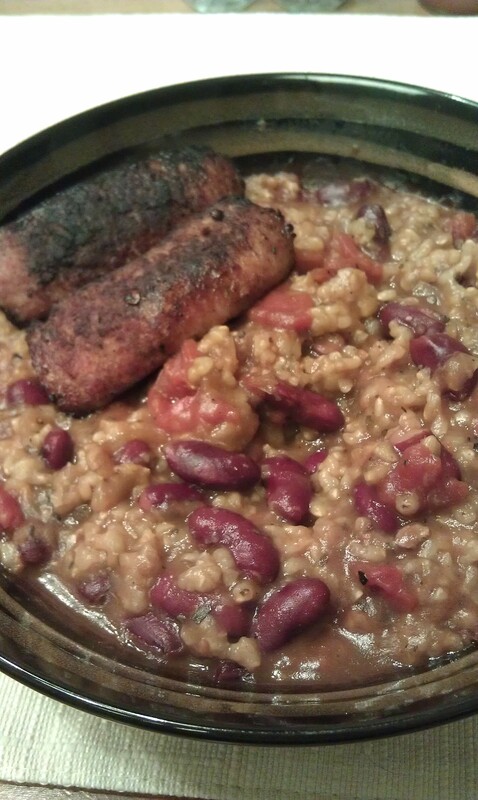 He loves red beans and rice and Conecuh sausage, but we’ve never had it together, so I subbed a little sausage for the bacon in this recipe, and then served more on the side. I know we had some left in the freezer, but not much, so I bought 3 more links, plus some cajun style on the way back from Florida. I think we are set for a little while anyhow (he really likes it for weekend breakfasts). Recipe as listed in the WW recipe files. 6 points plus. It’s not pretty, but it’s tasty. Coat a large nonstick skillet with cooking spray; heat over medium-high heat. Add onion and garlic to skillet and sauté until slightly softened, about 2 to 3 minutes. Meanwhile, place rice, broth, tomato puree, beans, bacon, chipotle sauce, oregano, salt and pepper in a 3- to 4-quart slow cooker; add sautéed vegetables. Cover and cook on low setting for 3 1/2 hours; stir in cilantro and scallion just before serving. Yields about 1 cup per serving. *I used brown rice, sausage instead of bacon, EVOO from the Misto instead of cooking spray, and 1/2 cup extra broth and let it cook 4 hours total.